Having a baby? Congratulations! 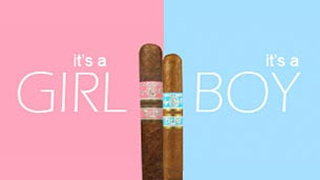 Looking for It's a Boy or It's a Girl Cigars to give out to your friends? Here at GothamCigars.com you will find top trusted brands offering a variety of It’s a Boy and It’s a Girl cigars from Rocky Patel, Arturo Fuente, Cuesta Rey, Alec Bradley and many more at discounted prices. Enjoy your special moment of joy and hapiness with your friends and family with a celebratory cigar. It's a Boy and It's a Girl Cigars are perfect way to commemorate this lifetime occasion and are designed to be a great keepsake for parents or hands out to friends and family. Our customer service team is standing by and always ready to assist you with selecting your celebratory cigar!